It’s almost that time of year – the snow is starting to melt (we can dream, right? ), the weather will warm up, and soon it’ll be the 2015 Spring moving season. If you’re relocating this year and you’re doing it yourself, here’s how to take the hassle out of your DIY local move. Let’s say your family, or even your company, is planning to move and you don’t want to hire movers – you’ve got this and you’re going to do it yourselves. It’s just down the road after all, so how hard could it be? Until you start pricing out cardboard boxes. Then you think, “Am I made of money?! Why is cardboard so expensive? 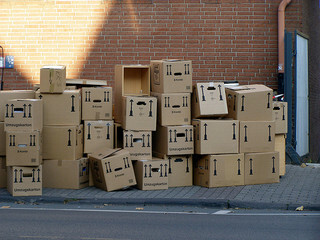 ?” And you realize that you don’t know what to do with the boxes when you’re finished. You can’t bear to waste them by throwing them out. What about trying to find someone else who needs them? Now your plan is starting to get more complicated. So skip all of that and work with our friends at Lend A Box. Lend A Box takes the pain out of moving by delivering super sturdy and clean plastic boxes to your door before your move. You pack your things in them, move to your next place, and then Lend A Box picks up their boxes. It’s that easy! No worrying about cardboard boxes, no messing with leftover boxes, and you get to handle all your important belongings yourself. Their boxes are also incredibly strong and can be stacked on top of each other for easy transporting on a dolly or hand truck. This is not a sponsored post – we just really appreciate what Lend A Box does to make its clients’ lives easier! 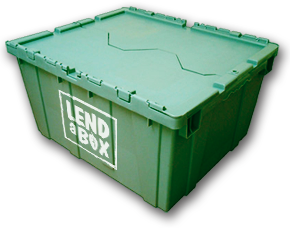 To talk with Lend A Box about your upcoming move, give them a call at or visit their website and get a quote at www.lendabox.com. You’ll be glad that you did! If you haven’t yet found your perfect home in Northern Virginia, we can help you get there – visit us at our website or call us at ! Bethany Stalder is a Buyer Specialist for Denae Judd & Associates. Before joining us, Bethany worked as a project manager for the Marine Corps where she managed several multi-million dollar military acquisition programs. She earned her Master of Business Administration from Georgetown University in 2012. The daughter of a career Marine, Bethany spent her entire life with the Armed Forces and considers it a privilege to now serve the community of military families and civil servants in the Northern Virginia area.